Ana joined StreetSquash Newark in 2015. She graduated from Pace University in 2006 with a BBA in Business Economics and earned a Master’s Degree in Public Administration from New York University in 2011. Ana has volunteer experience working with students in India. 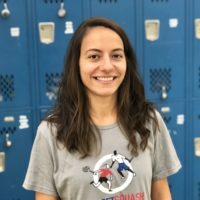 Prior to StreetSquash Newark, Ana was the Director of Operations with Roseville Community Charter School.